Normally, residential garage doors have a useful life of around 20 years, but what if you could extend it to 25 or even 30 and avoid serious issues? It’s all a matter of giving proper care to your unit and this starts with its installation. Discover the best practices for keeping your automatic door in great shape for a long time to come. Unless your garage door has come painted by the manufacturer, you will need to take care of this yourself upon installation, no matter whether you have a steel unit or a wood one. Choose exterior-grade paint recommended or approved by the brand. Some manufacturers suggest the use of car wax instead of paint for protecting the panels of steel doors in coastal areas and those with harsher winters. Connecticut residents can readily follow this piece of advice to get superb results. Remember that wood doors require repainting annually. Protective finish can be reapplied less often in the case of steel units. Which hardware parts need it? The list includes torsion springs, steel rollers and hinges. The opener’s drive should also be lubricated, if it is made of metal. Lubing is also needed for all spots where the trolley touches the rail while moving. This is required with all types of opener. Choose a type of lubricant which is light and won’t become sticky and thick over time. Consider a lithium-based product as it will withstand major temperature drops leaving your automatic door moving smoothly even during the harsh winter months. 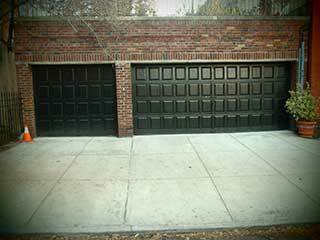 If you notice issues while lubricating the hardware, be sure to call us, at Garage Door Repair in Stamford. The force which these components use to operate the door should be tested seasonally and readjusted, if needed. This will prevent slowdowns in the opening of the door and difficulties with closing it. Another major benefit of the readjustments is that you will keep the rate of the wearing of the hardware low. The testing of both the spring system and the opener doesn’t require any special tools or skills. The seals help with providing insulation to the garage, but they are important for the protection of the garage door too. By keeping the garage better insulated, they lower the risk of opener and hardware malfunctions in case of extremely low temperatures. Additionally, the bottom seal protects the door from staying in contact with rainwater for long. The weather seals require replacement when they get worn out. Check their condition by turning off the lights inside the garage in the middle of the day. If sunlight comes in around the edges of the door, it’s time for new seals. The remote control is practically a key to your electric garage door so you should take the standard precaution measures to protect it. Preferably, you should carry it with you when you are out. Make sure that it’s not easily visible. Motor remotes don’t require any special kind of care apart from basic cleaning.